Check out these seven ideas for lighting up your interior design with versatile, eye-catching string lights. Indoor string lights are becoming more and more popular in home decor. It’s no wonder. 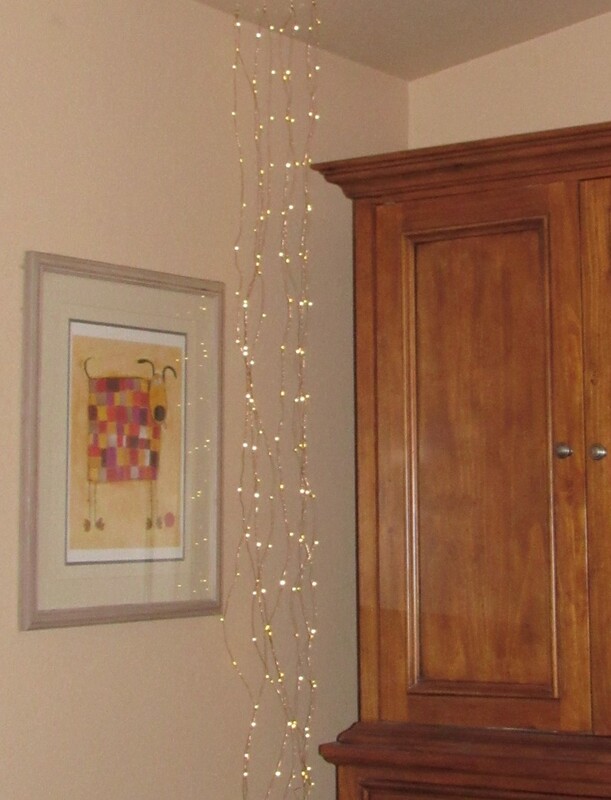 LED string lights are an inexpensive way to easily get some decorative sparkle into your space. But what are the best ways to use string lights in home decor? The best way to use string lights inside is by taking advantage of their convenient functionality. The most affordable and easily-used string lights are malleable copper wire string lights, sometimes called fairy lights. These lights come in both plug-in and battery-powered versions, and some of the battery-powered string lights even have remote controls that allow you to change the way the lights glow (constant or blinking) and/or allow you to set timers for when you want the lights to be on. 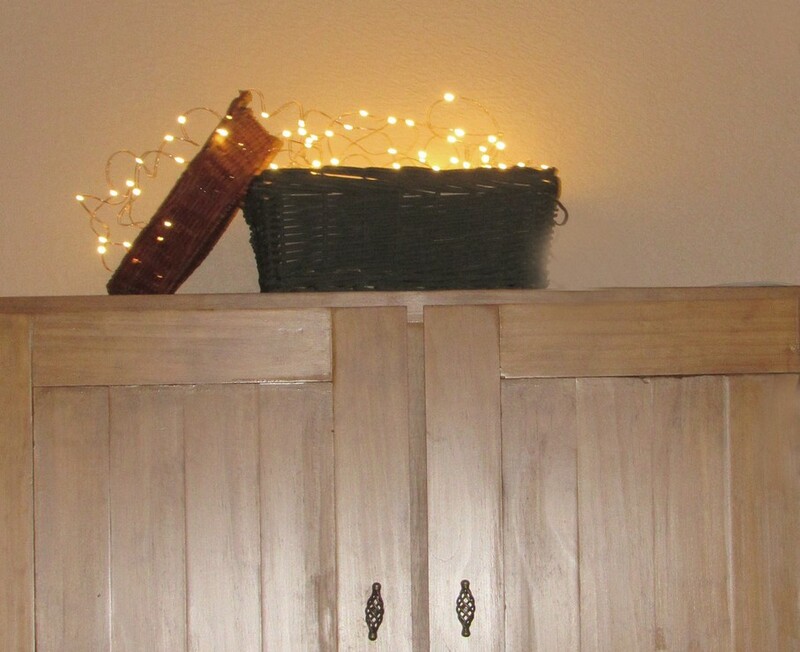 Because of these handy features, string lights can perform all sorts of decorating tricks. Here are seven indoor string lights ideas you can use to add the magic of these lights to your rooms. If you’re new to string lights in home decor, you may be wondering how to hang string lights without nails. Thankfully, most string light decor ideas don’t require nails. This first one certainly doesn’t. 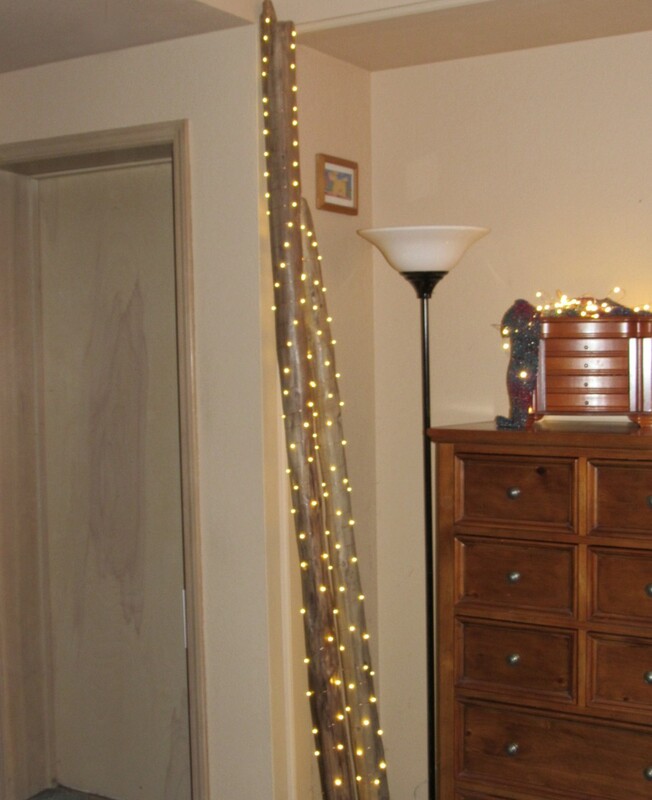 One of the easiest ways to use string lights is to use them to dress up a window treatment. To do this, simply drape a string of lights over your window coverings. You can just do this just along the top of your curtains or valance. 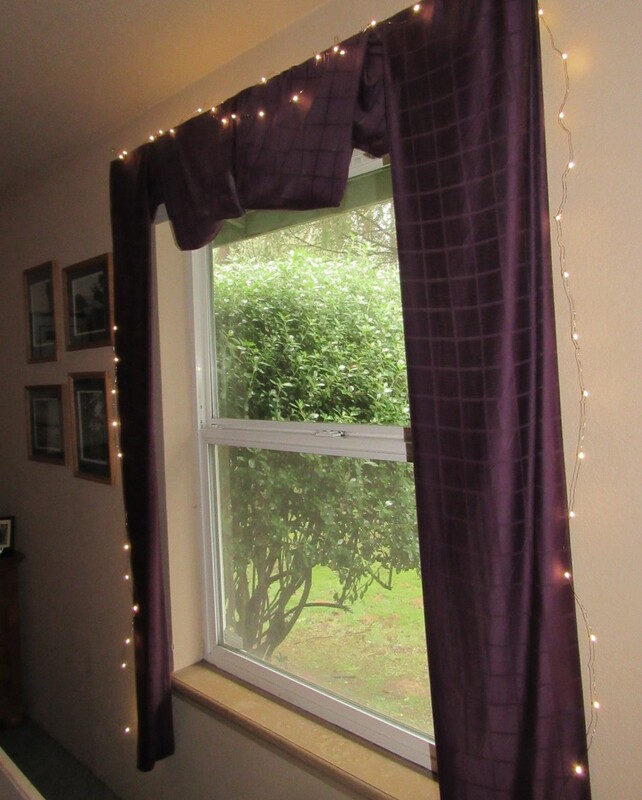 Or you can stretch a string of lights across the top and let its ends cascade down the sides of your window treatment. 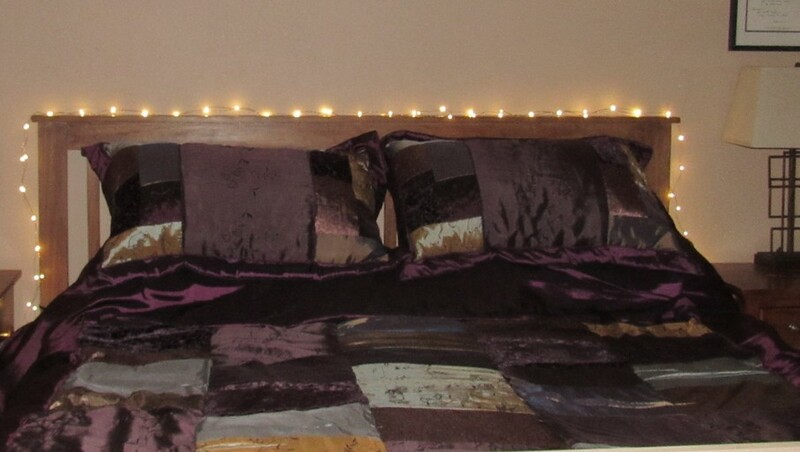 String lights are a delightful way to add romance to a bedroom. All you have to do is lay a string of lights across the top of your headboard and let the lights dangle down on either side by your nightstands. If you happen to work in bed, having lights in this location will help you make the shift from work-mode to bedroom mode. Just turn the lights on when you’re done working, and it will feel like you’re in a different room, even though you haven’t moved an inch. Another fun and creative way to use string lights combines the lights with organic natural elements to add texture and interest to your space. All you need for this string lights technique is a long stick or branch (or two or more if you’d like) and a string of lights. Wrap the string lights around the branch, and you’ll end up with a sort of old-fashioned barber-shop light swirl effect as the lights travel up the stick. The juxtaposition of electricity and nature makes for a strong visual impact in the room. You can create another deeply textural effect with string lights when you combine them with colorful textiles. Simply entwine the lights with a long silk or knitted scarf. Arrange the resulting marriage of luminosity and color on a piece of furniture or on a decor accent piece. One complaint some people have about copper wire string lights is that they tangle easily. If yours tangle, don’t fret. You can still use them. Just bundle up that tangled mess, place it in a basket or other decorative container, and let it spill out in all its chaotic splendor. This type of string lights decor is great for a dining room. It creates wonderful low-light ambiance for intimate meals. 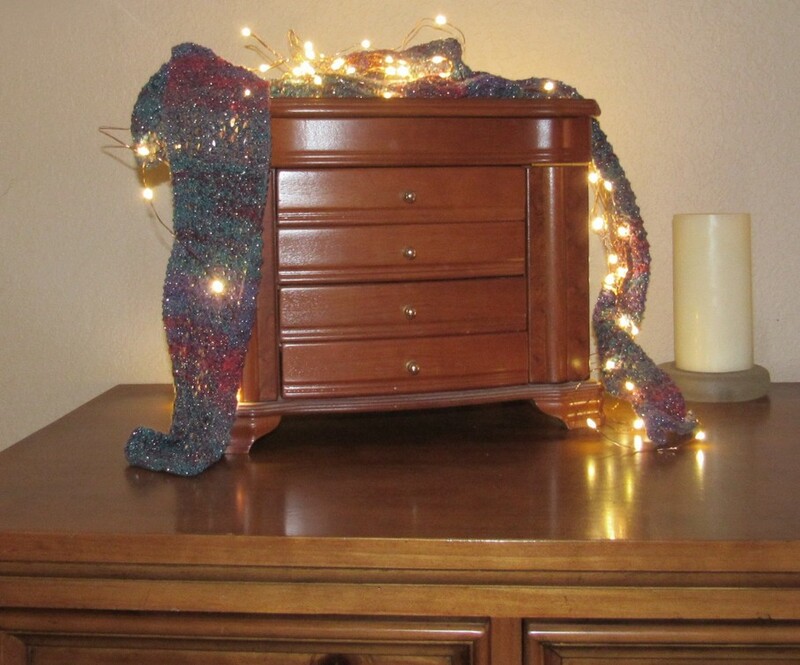 If you have a clear glass container, you can make a “lamp” out of string lights. Just place a string of lights in a cluster inside the glass container. Overturn the container and set it in place. Voila! 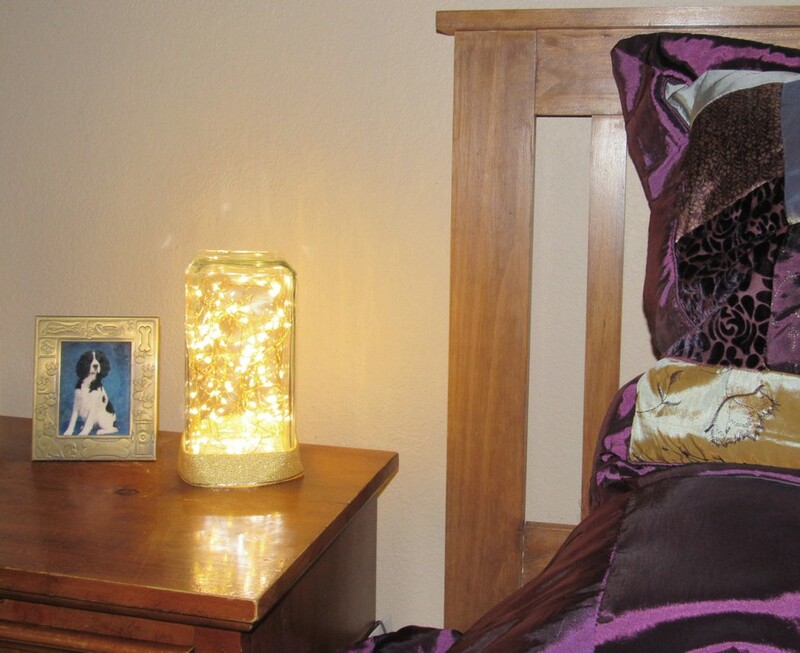 You have an eye-catching mood lamp. Battery-powered string lights with a remote work best for this so you don’t have a cord hanging out from underneath the glass container. You can add some interest to the jar as well by adding flat ribbon to the jar’s base. We put a Christmas tree in our bedroom during the holidays, and I love the effect of all those little white lights filling the room with festive warmth. A couple years ago, when we took our tree down, I missed those lights so much I wanted to find a way to get a similar feel without a tree. What did I do? I hung a couple strings of LED string lights from the ceiling. It only took two 33-foot LED light strings to get a little waterfall of white lights that delight me just as much as my Christmas tree does during the holiday season. I especially love this vertical flow of lights because it reminds me of rainfall. If you’re a rain-lover like me, hanging string lights this way will give you the kind of pluviophile-inspired decor that conjures the ahh feeling of a soothing rainfall. This string lights decor idea is the only one of the above seven that requires anything like nails. I hung my string lights from small white cup hooks, which are easily screwed into drywall without need for a hammer or a screwdriver. Hopefully the above ideas have sparked your imagination so you’ll be inspired to incorporate string lights into your own decor. If you come up with your own inventive ways to use string lights, please share them so we can all have even more fun with these playful lights.